Steam Linux Client Arrives on Ubuntu Software Center, Steam Games for Linux now on SALE! This has to be the biggest headline for the month. Gaming on Linux will never be the same again. It all started with rumors, which hinted at Valve's sudden change of mind and its new found love for Linux. This culminated with the eventual release of Steam for Linux client. And now, the Steam Client is available for download directly from Ubuntu Software Center. To commemorate the occasion, Valve is conducting Steam for Linux celebration sale with as much as 75% off on some of the most popular games! 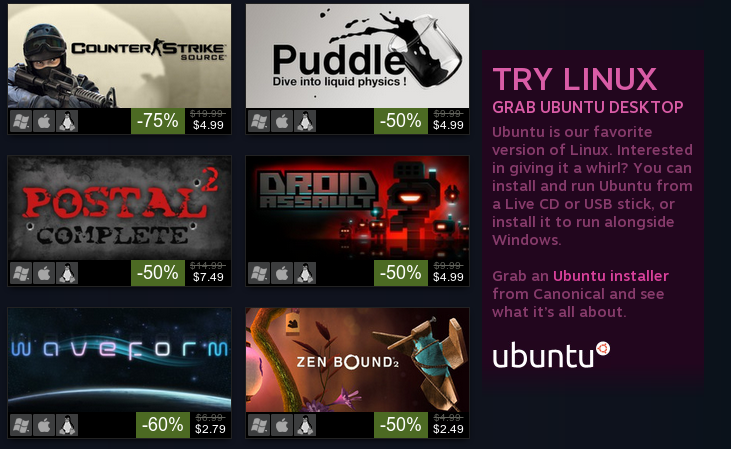 Steam Arrives on Ubuntu Software Center, Celebration Sale is ON! Although Steam for Linux client has been available for free download ever since Dec 2012, for a novice user to discover it was not easy. Not anymore. Steam client is now available in Ubuntu Software Center and it is currently a featured app too. Not many users could miss that. And to commemorate the occasion, Valve is conducting the biggest celebration sale of Linux games yet. You can now save 50-75% on every single game available for Linux. Even if you are a wannabe gamer, this is an opportunity you don't want to miss. Along with the celebration sale, you can also see some clever promotion of Ubuntu by Steam. This has got to be the year of Linux gaming for sure!